The most essential feature a contractor’s website should have is the compatibility for frequent editing. If the contractor’s main theme is real estate, the progress of construction needs to be updated on a daily basis for different properties. This also helps buyers to realize whether a particular block has been sold out. 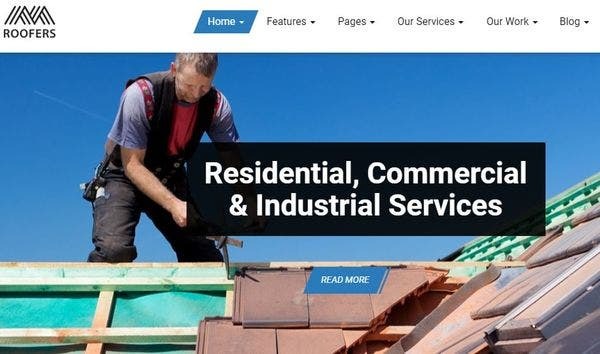 Contractor WordPress themes give this great advantage to users by way of flexibility in editing and adding new pages in sync with the users’ branding requirements. Since the page builder allows drag and drop option, a user does not need to have coding experience. 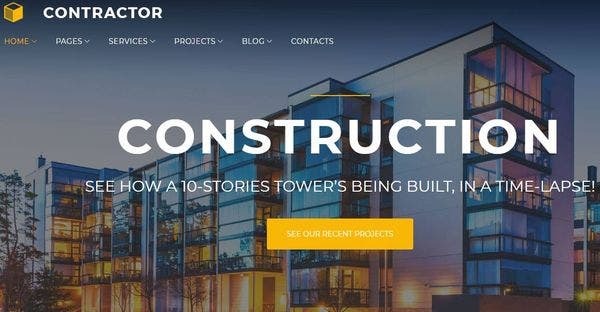 Architect WordPress theme comes with extensive theme options. It was last updated on 07 Dec 2018 and the WordPress version is 4.9.X. PHP, CSS and JS files are included in the responsive layout. It is well documented. 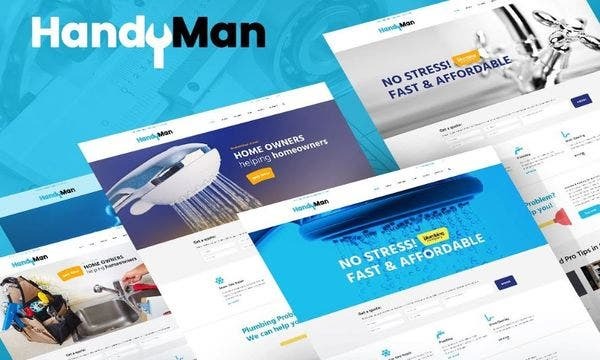 The developers claim that this is the fastest SEO WordPress theme. 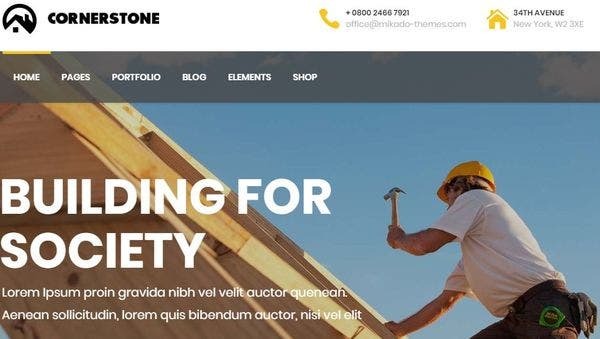 It has all the best MyThemeShop features. The theme which supports multi-languages is widget ready and supports WordPress versions 4.6 through 5.0.3. Support and updates are free for one year with optimized and secure codes. The theme is compatible with most third party plugins. The user gets six months support from Mikado themes and it can be extended up to twelve months. Users have given an average rating of 4.46 based on experience. It is compatible with all commonly used browsers. It is WooCommerce ready theme with an intuitive admin panel. It also has a large custom shortcode collection. Visual Composer addon and Slider revolution addon is included in the package. The clean modern WordPress theme design has full integration. State of the art Carousels option, typography options, one-page scroll, boxed and wide site layouts, integrated contact form 7, video support for Youtube and Vimeo. The smooth scroll and section scroller make navigation very easy. The package includes all future updates and is quality checked by Envato. 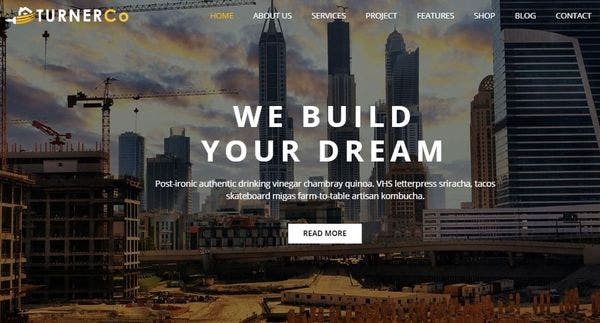 The architect WordPress theme which was first released on 16 September 2014 is compatible with IE 9, IE 10, IE 11, Firefox, Safari, Opera, chrome and Edge browsers. Google Developers has certified that it is mobile friendly. It is Retina ready. 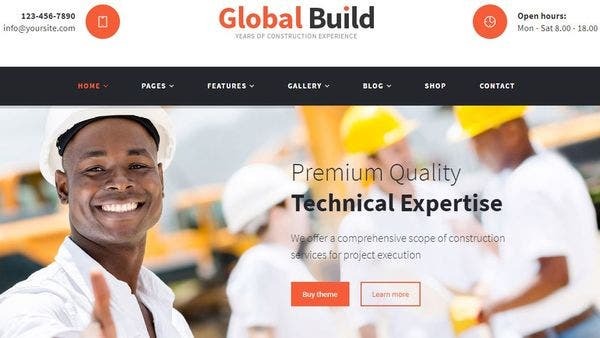 This WordPress theme runs on BuildPress layout for easy customization and site-building. Its code and page speed syncs with Google algorithms to produce excellent search results. This can be installed by WordPress business plan users and self-hosted WordPress users as well. The social media ready WordPress theme is responsive and loads well on all devices. 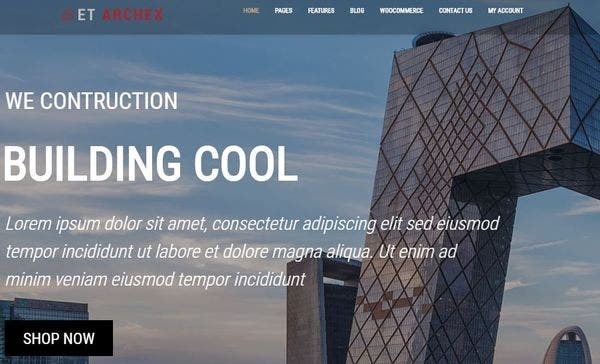 The architect WordPress theme is compatible with Visual composer 5.1.X and is not Gutenberg optimized. It is widget ready with high resolution. The compatibility for WP Bakery Page Builder is from version 5.1.X till 5.4.X. It has a price calculator which allows users to choose the required services and get an immediate quote online. 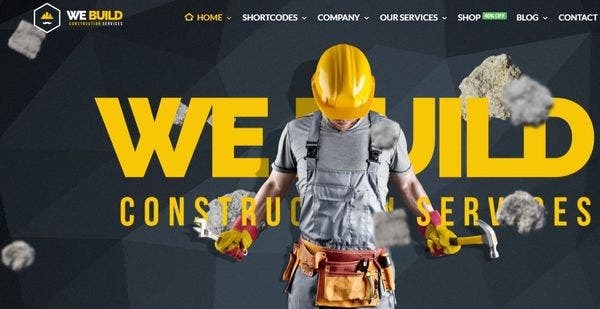 The multipurpose WordPress theme best suits construction and allied trades like architecture, construction, plumbing, carpentry and remodeling services. The codes used are Html 5 and CSS3. It has two menu styles with enable/disable function for multifunctional user panel. It has a media content manager, custom theme options panel and shortcode builder for easy customization. The responsive WordPress theme has Visual Composer, Revolution Slider, WooCommerce and other premium plugins included. Due to the UX design, the user can apply it for other related services websites too. The translator allows visitors to read in their own languages. The design idea includes full layered PSDs making customization very easy. 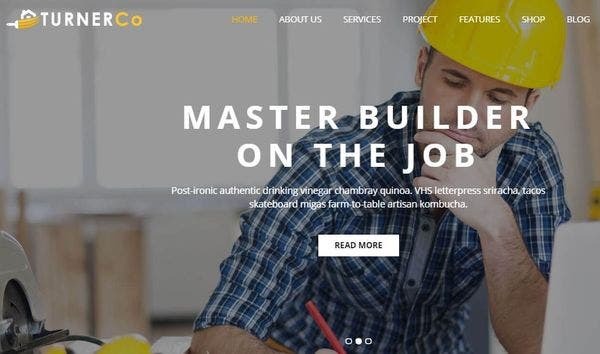 Corporate WordPress theme ideally suits individual contractors as well as business houses. The license is for one site with 1.3.4 changelog version. The developer provides 24 X 7 premium technical support and narrated video tutorials. The options panel allows for easy customization. The portfolio section is a great feature for contractors. The responsive theme is SEO ready and does not require set up or configuration. The portfolio page supports galleries of projects under different stages of construction. 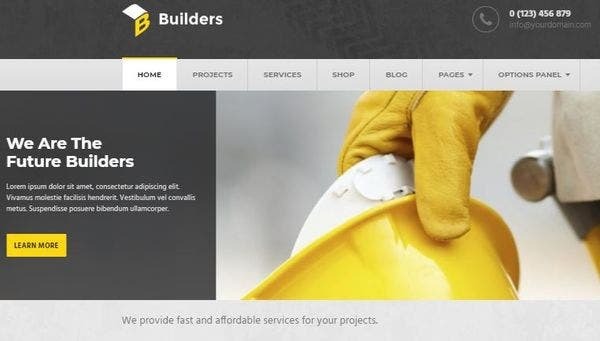 This builder WordPress theme can be applied to one domain owned by the user. The code is clean and approved by WP.org. It also has a Project page to showcase past projects. 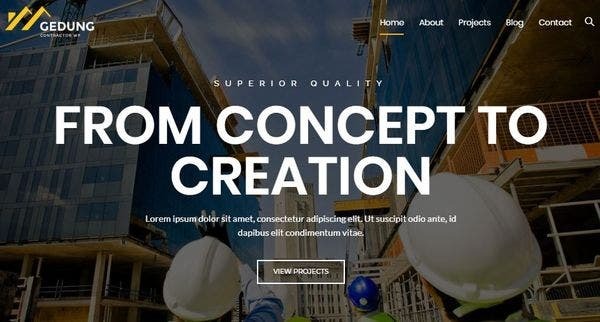 This professional grade WordPress theme can be installed with one click. 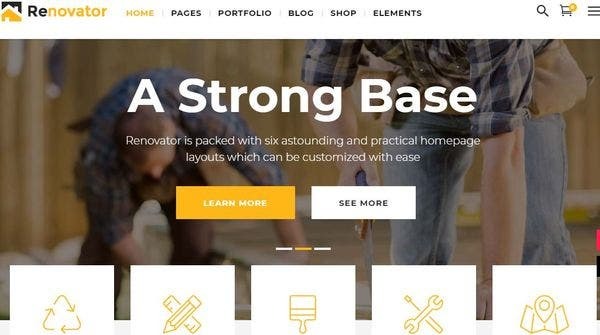 It provides six header styles with an unlimited combination of layouts on the home page. Since this is fully responsive, the display suits all mobiles, tablets, laptops and PCs. The SEO support extends to Yoast thus making the keywords to easily climb SERP. 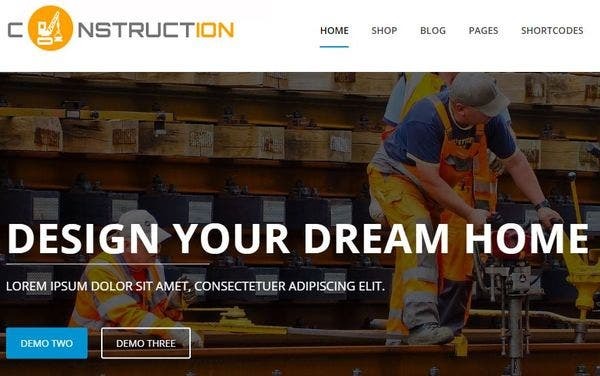 Construction Pro is a construction WordPress theme which allows three different header layouts to suit user needs. The built-in tools assists in configuring the home page with enable and disable options. Full social media integration and comprehensive options panel give maximum impact to SEO. The bundled review plugin gives a professional look to the theme. The skin has a GPL license and comes with many useful plugins. The installation wizard guides the user through all the steps to publish the website in a very short time. The power page builder has many customization options to extract optimum output from the dedicated pages. The page builder module includes accordion, audio, map and a number counter. This theme hosting offer is responsive and at the same time fast loading. 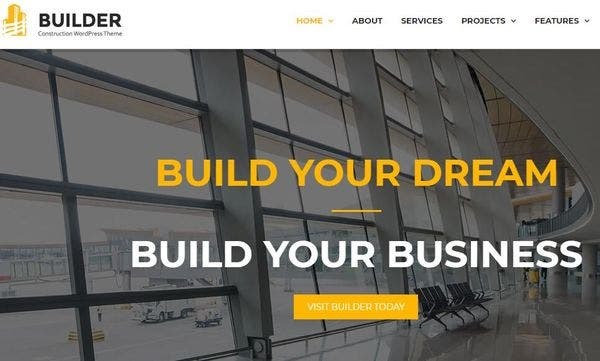 The drag and drop page builder theme facility ensures that the user need not use codes. It is compatible with 2.8.X Easy Digital Downloads with Events calendar Pro 3.12.X. The well documented responsive layout allows 4+ columns with enough tags. This supports PHP, CSS and JS file types with a responsive layout. 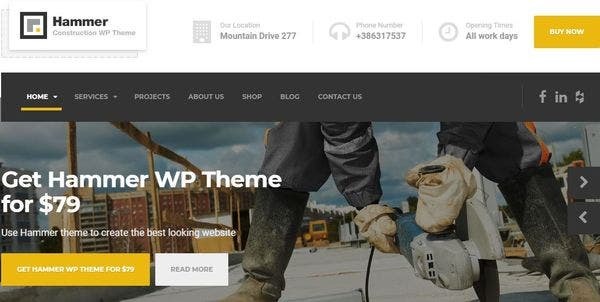 The modern WordPress theme is compatible with all popular WordPress Plugins like Visual Composer, Slider Revolution, Contact form 7, WPML and WP Instagram Feed. The system requires a minimum PHP version of 5.3 while allowing for Zip extension and a memory limit of 256 MB. 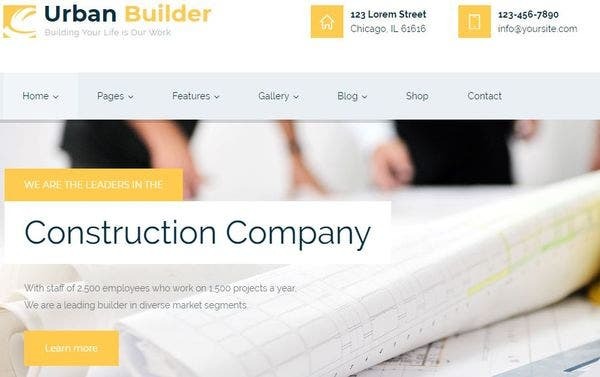 Besides custom layouts for construction companies, it also has features to include allied tradesmen like electricians, plumbers, landscapers, carpenters etc. It has Underscores framework and is compatible with WPML. The stylish WordPress theme is Retina ready and has Terri toolkit plugin. It is compatible with Contact Form 7 and Yoast SEO. This fully mobile responsive theme suits all devices and is easily editable and has quick installation features. The license version is GPL 2.0. It does not require coding experience and has a preview option before publishing for all viewers. It supports all commonly used browsers and is compatible with WordPress plugins. 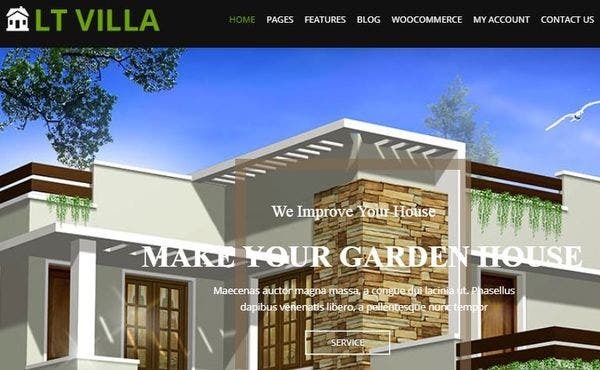 This fully responsive and Retina ready WordPress theme supports WPML. It has ten predefined colors and unlimited setting for colors. The mega menu support along with powerful shortcodes support is intended to make site creation easy for users. The developers provide 24/7 support. 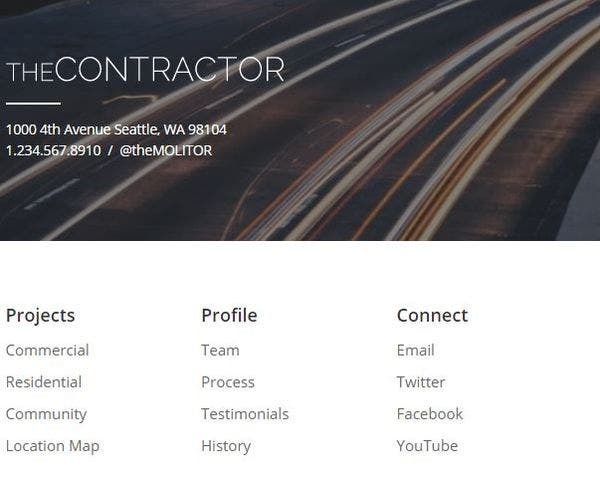 The about us, services and contact us pages have multiple layouts. This has a quick one-click demo install feature and also child theme support. 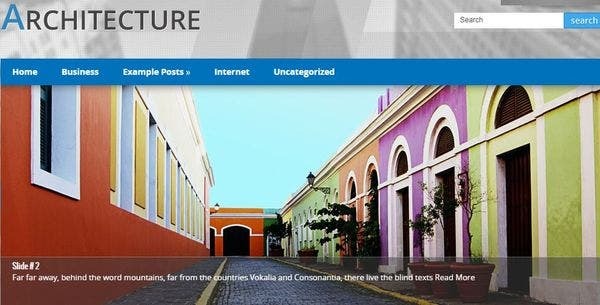 The multilingual WordPress layout features include six home pages, two types of menu styles, two footer styles, 3 blog styles and an enable/disable Retina facility. The slider options are Revolution slider as well as Post Slider. The three soothing colors of gray, white and blue makes the theme look distinct and polished. It is built on SMT 2.0 and Ecwid supported. The advanced anti-spam feature without the use of captcha words saves a lot of time for visitors to collect useful data. It supports multi-languages. 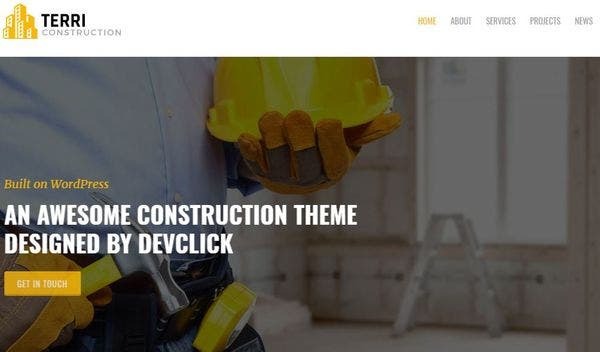 Version 1.7 of this exclusive construction theme has an engaging and informative design is fully compatible with “All on One SEO Pack” and “SEO by Yoast.” It supports two variants of icon display namely Fontella Icon Set and Images Icons. The shortcode for layout is fixed with updated plugins. 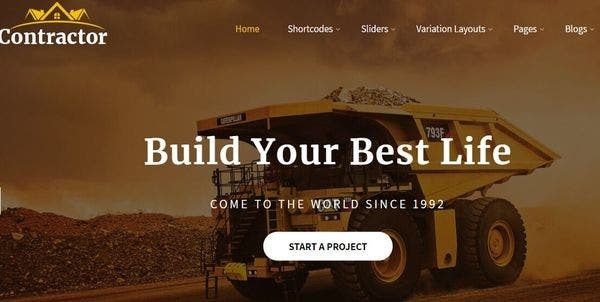 The logical reason why a WordPress user always sticks with the application is the freedom it offers along with a wide range of themes to suit any segment. The support provided is also par excellence and the ease of update is simply child’s play. These features are essential for a contractor in any field.